At the stroke of midnight, as the clock struck 12, on the 31st of July 2015, a few more people in the already independent countries of India and Bangladesh tasted the air of legal and political independence. In a post earlier, we had in detail discussed about the issue of India-Bangladesh land border dispute with respect to enclaves; an issue which culminated on the 31st of July with the agreement finally becoming official. 14,000 people who were de-jure a part of Bangladesh were not in all capacities a part of India, factually and legally. These 14,000 people are spread over 51 enclaves which belonged to Bangladesh earlier and have become a part of India now. With respect to Bangladesh, there are about 37000, spread over in 111, enclaves who have now become a part of Bangladesh, factually and legally. It was a cause of rejoice all over these territories as no more uncertainty looms over them – this emergent certainty now pervades over not only spheres like legal recognition of rights and land, but also over spheres like infrastructural development, healthcare, job opportunities, greater political outreach to the people from the government and of the people towards the system. 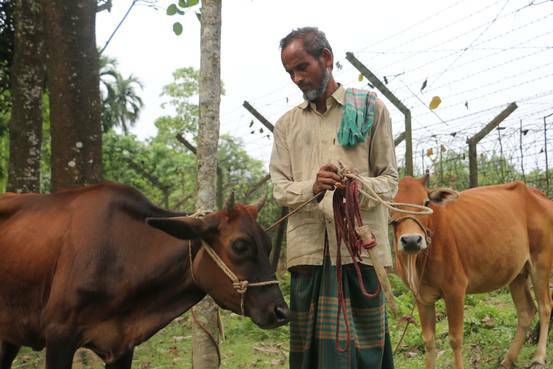 Abdul Jalil tends to his cows near a barbed-wire fence along the India-Bangladesh border. In another enclave, Dashiar Chhara, Sharifa Akter, 20, held a candle in her hand and smiled. “I can now fulfil my dream of being a top government bureaucrat,”.“We’re now human beings with full human rights,” said Maidul Islam, 18, of the handover.